Blitzer’s report aired in CNN’s 1 p.m. hour and an in-depth report will air in the 6 p.m. ET hour of The Situation Room with Wolf Blitzer. A transcript is after the jump. WOLF BLITZER, HOST: Now to a CNN exclusive that we have for you. I want to take you 45 feet underground, inside a labot — an elaborate Hamas tunnel that was running from Khan Yunis in Gaza to Southern Israel. Israel says the main goal of its Gaza offensive right now is to destroy these Hamas tunnels used to smuggle weapons, launch attacks. Here’s our entry into the tunnel. UNIDENTIFIED MALE: Are you sure? BLITZER: No, I’m not scared. BLITZER: All right. All right. All right. OK. All right. And I guess the tunnel was built for relatively short people, because if you stand up you’re going to hit your head. It’s not that tall. But you see, it’s pretty — pretty secure, this concrete. They spent a lot of effort building this tunnel. And they say it’s 14 meters or so under the ground, underground, maybe close to three kilometers. 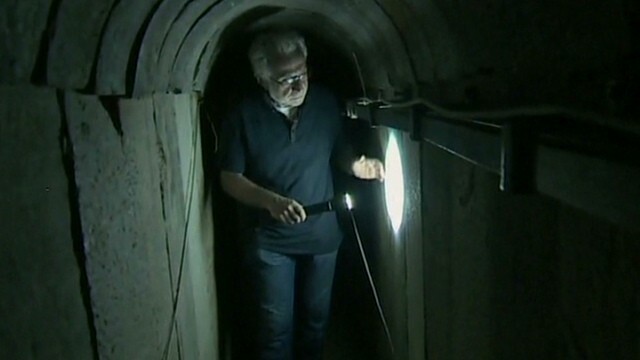 BLITZER: Once inside the tunnel, I spoke with an Israeli military officer who said Hamas has used concrete that they got, actually, from Israel to build this tunnel. Here’s part of my interview about where the tunnel goes, what it involves, how it was built. BLITZER: All right, we’re here in this tunnel with Lieutenant Colonel Oshik Azouli. You know this tunnel well. LIEUTENANT COLONEL OSHIK AZOULI, DEPUTY COMMANDER, SOUTHERN GAZA BRIGADE: Yes. BLITZER: Tell me about the tunnel. AZOULI: OK. This tunnel can come from in Gaza, as you say, from Khan Yunis. It’s come very close to the kibbutz in Ashroshar (ph). It’s like 600 meters from a kibbutz in Ashroshar. This tunnel is not ready for execute, because we found it before the terrorists in Hamas end the — end the operation, end the tunnel. And when we dig and we found it after a few weeks of checking this place, this area. BLITZER: And they wheel it out. AZOULI: Yes, wheel it out to Khan Yunis. BLITZER: How long do you think it took them to build a nearly three kilometer tunnel like this? AZOULI: It’s like two years to dig. It’s a one meter for a day, a few meters for a day. And they made a lot of time to do it. BLITZER: But they obviously spent a lot of time. And you say this concrete came from Israel. How do you know it came from Israel? AZOULI: Because we found a — we found bags. AZOULI: The bags. The bags who — the sandbags in the Karom Shalom (ph) station. BLITZER: So basically, the concrete was provided by Israel to Palestinians in Gaza to build schools, hospitals, stores, apartments, but they used it, what you say, to build this tunnel? BLITZER: The electrical power for Gaza. AZOULI: — for Gaza. And the people in Gaza can’t use their electricities a few — like a few hours on a day. And all this stuff to build the tunnels. BLITZER: How many tunnels like this are there that you’ve found so far? AZOULI: I can’t say that quickly the number, but we have many of the tunnels. AZOULI: Yes, something like this. BLITZER: — or something — something like that, similar, the same length, the same height, the same — and — and from what you know, what was the purpose of this tunnel? BLITZER: That’s a kibbutz right over here? AZOULI: Yes. We — we don’t have a base of soldiers near to — to this — this way. The fence, it’s like nine meters from here, nine — 900 meters from here. BLITZER: The border — the border fence? AZOULI: The border. The border. And in the border, soldiers. AZOULI: If they want to attack us, it’s — I mean it’s OK for us to be in a battle, but they want to attack regular people, children, women, men. And it’s very close to Ashroshar. BLITZER: So they wanted to go in and attack, kill Israelis. BLITZER: That was — that was one of the rationales that Israelis have suggested was one of the purposes of these tunnels.